LIVE! VACATION! ENTERTAIN! Who says you cant have it all? Former Model in Exclusive Gated Community. Grand two story entry featuring Formal LR and DR, Great room and breakfast area. Chef's Kitchen has SS appliances, double ovens, walk in pantry and Lg center island. 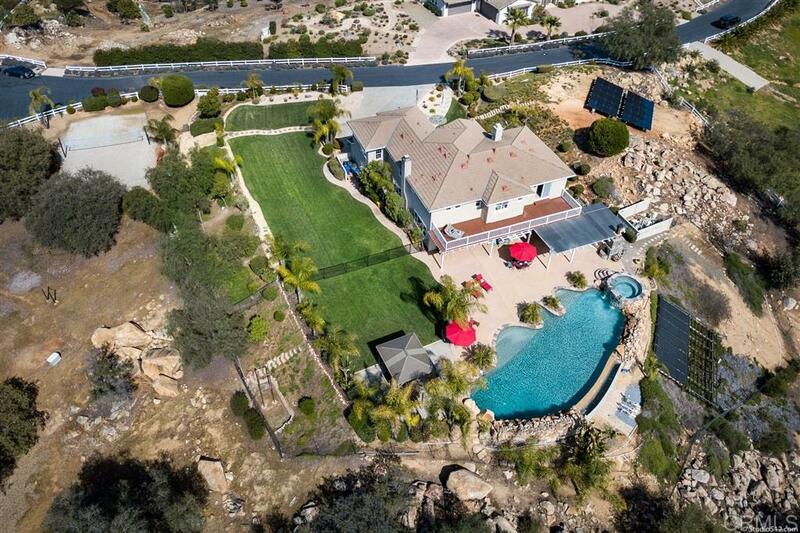 It's about the California lifestyle 22 Yard Vanishing Edge Pool/Spa/Water features, 40 Solar Panels, extensive landscape rock, Sand Volleyball, Complete Summer Kitchen & Tree House over 2 Acres + RV Parking and VIEWS VIEWS Bring your Horses!, Welcome to Country Living RESORT STYLE. Original Owners have spared no expense on their lifestyle home. Raised their family and hosted many events, now ready to RETIRE. Stunning curb appeal, grass play area YES GRASS to RUN, JUMP, PLAY, lawn bowling, Croquet and Badminton. This property boasts so many extras: 40 Photovoltaic Solar Panels 10.6 kwh ground mount fully paid for (no lease here), Pool Solar, Built-Ins upstairs and down stairs, Fire Sprinklers, Family room has BOSE Speakers, Septic has newly installed risers, Complete fencing around pool, extensive landscape including professionally placed boulders, Vanishing Edge Pool, 22 Yards Long and 4 foot SPA Pool is 8.5 Feet deep, multiple water features and spillways, Pebble Tec with Flagstone finish, Large bedroom downstairs with full bath, 4 bedrooms upstairs including Master with large sitting area cozy fireplace, walk in closet, coffee bar. Open your juliette balcony and let in the breezes day or night, walk out onto your private sun deck, enjoy your morning coffee. Brilliant builder put laundry upstairs. X Large Propane Tank, 2 New water heaters. Summer kitchen features BBQ Island with seating for 8, refrigerator, burners, sink, TV, Crazy large wood burning fireplace, 3 overhead fans, extensive landscape lighting, lots of room for patio furniture, Additional Pergola with fire pit. Beautiful Sand Volley Ball court, Conex Storage Container, adorable rustic tree house and lots of room for RV Parking.